Vanadium Nanorods are elongated particles ranging from 10 to 120 nanometers (nm) with specific surface area (SSA) in the 30 - 70 m2/g range. Nano Vanadium is also available passivated and in Ultra high purity and high purity and coated and dispersed forms. They are also available as a dispersion through the AE Nanofluid production group. Nanofluids are generally defined as suspended nanorods in solution either using surfactant or surface charge technology. Nanofluid dispersion and coating selection technical guidance is also available. Other nanostructures include nanoparticles, nanowhiskers, nanohorns, nanopyramids and other nanocomposites. Surface functionalized nanorods allow for the particles to be preferentially adsorbed at the surface interface using chemically bound polymers. Development research is underway in Nano Electronics and Photonics materials, such as MEMS and NEMS, Bio Nano Materials, such as Biomarkers, Bio Diagnostics & Bio Sensors, and Related Nano Materials, for use in Polymers, Textiles, Fuel Cell Layers , Composites and Solar Energy materials. Nanopowders are analyzed for chemical composition by ICP, particle size distribution (PSD) by laser diffraction, and for Specific Surface Area (SSA) by BET multi-point correlation techniques. Novel nanotechnology applications also include quantum dots . High surface areas can also be achieved using solutions and using thin film by sputtering targets and evaporation technology using pellets, rod and foil Applications for Vanadium nanorods generally involve their magnetic properties and include in catalysts and magnetic recording and in medical sensors and bio medicine as a contrast enhancement agent for magnetic resonance imaging (MRI). Vanadium particles are being tested for site specific drug delivery agents for cancer therapies and in coatings, plastics, nanowire, nanofiber and textiles and in certain alloy and catalyst applications . Further research is being done for their potential electrical, dielectric, magnetic, optical, imaging, catalytic, biomedical and bioscience properties. Vanadium Nano Particles are generally immediately available in most volumes. Additional technical, research and safety (MSDS) information is available. See more Vanadium products. Vanadium (atomic symbol: V, atomic number: 23) is a Block D, Group 5, Period 4 element with an atomic weight of 50.9415. The number of electrons in each of Vanadium's shells is 2, 8, 11, 2 and its electron configuration is [Ar] 3d3 4s2. 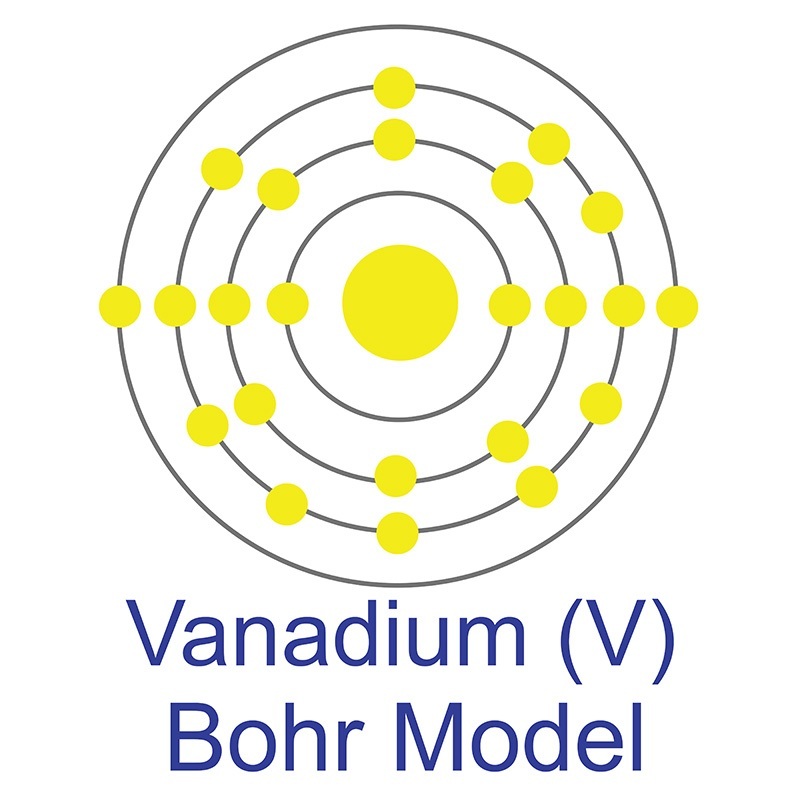 The vanadium atom has a radius of 134 pm and a Van der Waals radius of 179 pm. Vanadium was discovered by Andres Manuel del Rio in 1801 and first isolated by Nils Gabriel Sefström in 1830. In its elemental form, vanadium has a bluish-silver appearance. It is a hard, ductile transition metal that is primarily used as a steel additive and in alloys such as Titanium-6AL-4V, which is composed of titanium, aluminum, and vanadium and is the most common titanium alloy commercially produced. Vanadium is found in fossil fuel deposits and 65 different minerals. Vanadium is not found free in naturehowever, once isolated it forms an oxide layer that stabilizes the free metal against further oxidation. Vanadium was named after the word "Vanadis" meaning goddess of beauty in Scandinavian mythology. Phosphorus-doped cerium vanadate nanorods with enhanced photocatalytic activity. Cost-effective synthesis and superior electrochemical performance of sodium vanadium fluorophosphate nanoparticles encapsulated in conductive graphene network as high-voltage cathode for sodium-ion batteries. Surface modification by vanadium pentoxide turns oxide nanocrystals into powerful adsorbents of methylene blue. Switching charge transfer process of carbon nitride and bismuth vanadate by anchoring silver nanoparticle toward cocatalyst free water reduction. Europium(III)-doped yttrium vanadate nanoparticles reduce the toxicity of cisplatin. Nano Silver Vanadate AgVO3: Synthesis, New Functionalities and Applications.